Congratulations to Laurie VanderPloeg. I just returned from the Michigan Association of Administrators in Special Education Summer Institute in Traverse City, Michigan. What a great meeting! The group of 600 SPED ADMIN professionals gathered to learn, network, and yes, have fun last week. I was very honored to be one of their speakers. President Dawn Bentley is really working hard with the rest of the MAASE executive committee to increase their CEC/CASE unified membership. Former CASE Policy and Legislative chair and a past president of MAASE, Donna Tinberg took pictures of the CASE members proudly displaying their CASE member ribbon on their nametags and the pictures were a big hit during break! MAASE was the very first unit to invite me to give a keynote after I was appointed CASE Executive Director. It was at their January meeting and I actually had to go out and buy a coat! It was great to hear the great presentations and I especially enjoyed the "technology/social media" strand! Special thanks to PD chair, Sue Pearson for including these great sessions on EverNote, YouTube, Twitter, and Pinterest for educators! It is always great to hear Dr. Steve Kukic give one of his thought provoking talks on where we all need to be going for the improvement of student achievement! But I have to tell you the real highlight of the meeting was when the Marvin Beekman award was given to CASE Past President Laurie VanderPloeg! MAASE has always done an exceptional job of recognizing their stellar members. I remember being blown away that very first conference I attended in January 2003 when the Batten award was given and it was a gold ring ... I had never heard of a group giving a ring before — kind of like a Super Bowl ring! CASE has actually honored the MAASE unit as an Outstanding unit in the area of Awards. Prior to Laurie receiving the award, there was an amazing video on Marvin Beekman's life and his contributions to the students, administrators and Michigan education. It is so important for us to remember and honor our history! MAASE also has a tradition of asking all the previous Beekman recipients to come up to the front and be recognized and any who have passed away, have their names called and a moment of silence observed in their honor. The previous year recipient then gives a short speech. The 2013 winner was Donna Tinberg, who as mentioned above I have been very privileged to serve with on the CASE executive committee. Donna delivered a moving speech on the history of MAASE and the importance of collegial support and networking. She spoke of the importance MAASE and CASE have held in her career. I was so proud to call her my friend and colleague. President Dawn Bentley did a very thoughtful and complete introduction of the 2014 recipient by reading from the various letters of recommendations—but she alternated using "he" and "she" so to leave the identity to the last moment. Laurie was truly surprised and as always gracious and humble with the award. It was great for her good friend Dr. Kukic to still be there to share and it was a huge surprise to have her husband, father, sister, children, grandchildren, boss, and other family and work colleagues all be there to support her! We need to spend more time recognizing the wonderful people and work that is done by our members on a daily basis! Speaking of Special Recognition ... With this need to provide even more recognition, CASE is proud to announce a NEW award. Due to the ideas and generosity of Kevin Gersh, CASE is going to be giving a new award at our 25th Annual CASE Conference in San Antonio this year. The award will be call the "G" award. The award will be presented to an administrator who is a member of CASE and in their first three years administering special education programs and/or services, and who embraces 5 important values: "Heart" is at the core of what we do, Lead by example, Be honest, Think outside the box, and Always use a collaborative approach. 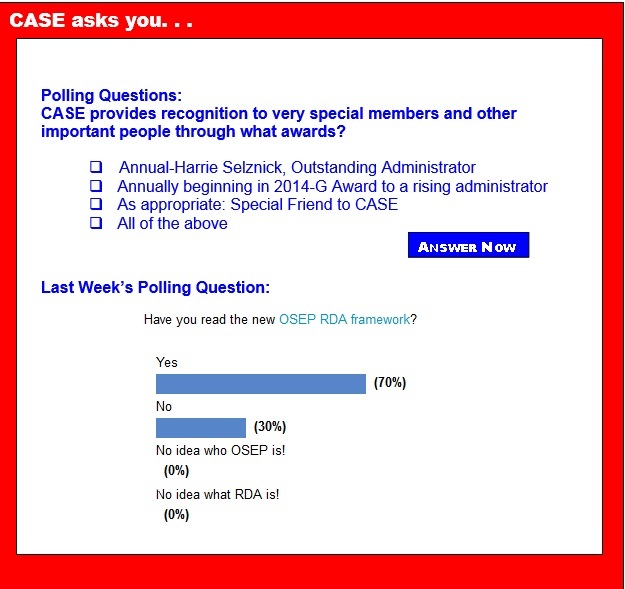 Members of CASE can nominate a Special Education Administrator in their district/school by telling their story and how they support their teachers enabling them to go above and beyond for children with disabilities. The winner will be determined by the CASE Award Committee. This award is a "thank you" to this administrator for sticking his/her neck out to better support their teachers to enable them to make a difference in the lives of the students they serve. Click here to download a more detailed description of the CASE awards. Watch for the nomination form on the CASE website in the next few weeks! Have you filled all your vacancies yet? If you haven't visited the CASE interactive job board at the CASE Career Center, now is a good time to do so! With its focus on special education administrators and professionals, the CASE Career Center offers members, and school districts, a highly targeted resource for online recruitment. Both members and nonmembers can use the CASE Career Center to reach qualified candidates. Employers can post jobs online, search for qualified candidates based on specific job criteria, and create an online resume agent to email qualified candidates daily. They also benefit from online reporting providing job activity statistics to track each job posting's return on investment. As a special education administrator, you want the best outcomes for your students. Here's a chance for your teachers to gain free trial access to the Council for Exceptional Children's Web-based transition planning curriculum and assessment, Life Centered Education. Developed by a group of 18 authors, LCE is an evidence-based, nationally-normed curriculum designed to build real-life skills in daily living, self-determination, and employment working with students in middle school and high school. LCE contains over 450 assessment items and 1200 lesson plans aligned with the Common Core State Standards. To sign up for a free trial to LCE, please send an email to Anu Prabhala at anup@cec.sped.org. The free trial starts right away and allows you try out both the teacher and student portal of LCE. The Kids In Need Foundation, a national, nonprofit organization dedicated to providing free school supplies to economically-disadvantaged school children and under-funded teachers, is pleased to announce grants sponsorship by the Dollar General Literacy Foundation to improve preK to 12th grade students' reading levels. To equip special educators to take on the Common Core State Standards, PresenceLearning has released a new whitepaper. "Getting to the Core of the Common Core," the latest addition to PresenceLearning's growing library of resources, provides information about how educators can help students attain the foundational oral language skills needed to successfully to meet the CCSS. For the seventh year, Jo-Ann Fabric and Craft Stores is sponsoring the Kids In Need Foundation's teacher grant program. Certified teachers in the US can apply for these grants online at www.kinf.org from July 15 - Sept. 30. It pays!—Invest in your students’ preparation to succeed. Positive Action is a Pre-K—12 program that is proven to help students learn. Endorsed by CASE and rated top program on What Works Clearinghouse for improving academics, behavior, and character; is a CASEL program for social & emotional and more! It's August ... Do you know where your members of Congress are?! They're at home, having recently returned for a five week recess from Washington, D.C.! And for CEC advocates, it's time to go to work! Your mission is simple: schedule meetings with your elected officials at their district office anytime from now until Congress reconvenes Sept. 9. With Congress expected to take action on education funding, now is the time to meet with your Congressional delegation! Recently, the U.S. Department of Education's Office of Special Education and Rehabilitative Services and Office of Career, Technical and Adult Education have invited the public to share their comments and recommendations on their blog to help implement the Workforce Innovation and Opportunity Act, which was recently signed by President Barack Obama on July 22, 2014. Skilled readers are often able to make sense of words suffering from "typos" and jumbled up letter orders as long as the beginning and end letters of the words are correct. But a study at the University of Leicester suggests that young developing readers also have a similar understanding of how these outside letters can help make sense of words. The study found that while developing young readers and skilled adult readers had similar difficulty correctly recognizing anagrams that can form another word by switching the order of only the inside letters, both age groups found it equally easy to recognize anagrams when the outside letters also had to be switched around to form another word. The upcoming school year is getting closer and closer. All kids who are headed back to school will have to manage some level of transition. For basically all kids, this requires them to become more focused, more disciplined, and more organized. Kids with ADHD may have an even more difficult time with this transition particularly if their summer has allowed them much more flexibility, freedom and less demands than the school year. Imagine a job in which your work every day is micromanaged by your boss. You are told exactly what to do, how to do it, and when to do it. You are required to stay in your seat until your boss says you can move. Each piece of your work is evaluated and compared, every day, with the work done by your fellow employees. You are rarely trusted to make your own decisions. Research on employment shows that this is not only the most tedious employment situation, but also the most stressful. Micromanagement drives people crazy. Kids are people, and they respond just as adults do to micromanagement, to severe restrictions on their freedom, and to constant, unsolicited evaluation. A new education ranking found that students in New Jersey are receiving a much better education than students in Mississippi. The ranking, from the personal finance site Wallethub, outlines the best and worst states for K-12 education, given the connection between one's education and future earning potential. The ranking was based on 12 factors, including student dropout rate, pupil/teacher ratio, test scores, rates of bullying and school safety measures. Across the country, children, parents and teachers of applicable states are spending their summers dreading the return of the controversial Common Core State Standards Initiative. If recent poll results are any indication, the fervor of last spring's backlash against the standards hasn't died down. The U.S. Department of Education has concluded that two Virginia public schools denied the right of education to emotionally disabled students after discovering teachers had frequently secluded and restrained them. The department wrote in a July 29 letter of findings that it had entered an accord with the two public schools in Prince William County, PACE East and PACE West, to correct the problems. The schools are for students with serious emotional and behavioral problems. The department's investigation followed a complaint filed in 2012. When it comes to brain development, time in the classroom may be less important than time on the playground. "The experience of play changes the connections of the neurons at the front end of your brain," says Sergio Pellis, a researcher at the University of Lethbridge in Alberta, Canada. "And without play experience, those neurons aren't changed," he says. ADHD seems to be the buzzword of the decade when it comes to children who can't sit still, have a hard time concentrating on one task at a time, or act impulsively. Attention deficit hyperactivity disorder is certainly no laughing matter — it can be a stressful situation for kids with the diagnosis, as well as for their parents. According to the Centers for Disease Control and Prevention, almost 11 percent of U.S. children between the ages of 4-17 had been diagnosed with ADHD in 2011, compared to about 9.5 percent in 2007. In the mid-2000s, the rate of diagnosis in kids was rising by about 6 percent per year. This begs the question: What on earth is going on? Is school testing driving parents away from their child's school? John Sides, a contributor for The Washington Post, writes: "In a newly published article, University of Massachusetts political scientist Jesse Rhodes investigates how state education reforms may affect parents' engagement in their child's school. I asked him some questions about his research and his disconcerting conclusions. A lightly edited transcript follows." Skilled readers are often able to make sense of words suffering from "typos" and jumbled up letter orders as long as the beginning and end letters of the words are correct. Does the way a classroom is decorated affect learning? A new study tries to determine whether there might be a correlation between how a room is decorated and kindergartners' learning. The researchers wanted to know if too many decorations could actually be distracting or overstimulating for young minds. For students with intellectual disability, functional skills are often prioritized over academics, but a new study finds that children with low IQ are capable of learning to read. Recently, the U.S Department of Education published a Notice in the Federal Register inviting applications for a new award to establish and operate a National Technical Assistance Center on Improving Transition to Postsecondary Education and Employment for Students with Disabilities. Dates: Comments due on or before Sept. 2. The following Notice of Agency Information Collection Activities; Comment Request; Annual Protection and Advocacy of Individual Rights (PAIR) Program Assurances was published in the Federal Register on Tuesday, July 1, 2014. In accordance with the Paperwork Reduction Act of 1995 (44 U.S.C. chapter 3501 et seq. ), ED is proposing an extension of an existing information collection. Dates: Applications Available: July 1. Date of Pre-Application Meeting: July 22. Deadline for Transmittal of Applications: Sept. 2. The following Notice of Applications for New Awards; National Institute on Disability and Rehabilitation Research-Disability and Rehabilitation Research Projects and Centers Program-Minority-Serving Institution Field-Initiated Projects Program was published in the Federal Register on Tuesday, July 1. Notice inviting applications for new awards for fiscal year (FY) 2014. Catalog of Federal Domestic Assistance (CFDA) Numbers: 84.133G-4 (Research) and 84.133G-5 (Development). Dates: Applications Available: July 2. Deadline for Transmittal of Applications: Aug. 18. The following Notice of Applications for New Awards; Technical Assistance and Dissemination To Improve Services and Results for Children With Disabilities — National Technical Assistance Center on Improving Transition to Postsecondary Education and Employment for Students With Disabilities was published in the Federal Register on Wednesday, July 2. Notice inviting applications for a new award for fiscal year (FY) 2014. Catalog of Federal Domestic Assistance (CFDA) Number: 84.326E.